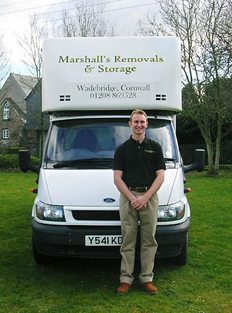 Cornwall Removals and Storage experts Marshall's Removals & Storage are based in Wadebridge, North Cornwall. We offer a responsive and reliable moving service to both domestic and commercial customers looking to move house or premises. You can leave it to us to take care of all of your moving requirements, and our professional family run removals team will create a friendly atmosphere to make your move as stress free as possible. Whatever your logistical challenge Marshalls Removals and Storage can offer a solution. Whether you need a few days storage between your house moves or next day delivery nationwide we can formulate a scenario to suit you and your individual situation. 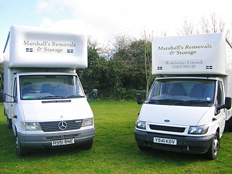 At Marshall's Removals and Storage, Cornwall we have a number of different vehicles that can deal with every different move. For instance we have small removals vans that can access the narrow roads in Cornwall and larger vehicles that can convey the more extensive house moves. Before moving it is important that possessions are well packed and ready for transportation, effective packing can ensure the safety of your possessions. With this in mind we offer our customers a full packing service; this can just range from packing china and glass through to packing all of your possessions. All your belongings are handled with as high a level of care as possible both during packing and removal. Our team of expert packers from Cornwall use specialist packing materials and they know exactly how to pack your possessions so as not to damage them. Otherwise, if preferred, we can provide boxes and packing materials for those who want to pack themselves, for example we supply wardrobe cartons, bed and upholstery bags, bubble wrap, wrapping paper and book cartons. Contact Cornwall Removals and Storage specialists, Marshalls Removals for more information on the services available to you on 01208 869528.